The current version of iRIS is compatible with all browsers and Windows, Mac and Linux operating systems. See the FAQs for more info. You must have a MyAccess account to get into iRIS. Follow the instructions below if you do not have a MyAccess account or a UCSF ID. Sponsors are not considered affiliates and do not qualify for access to iRIS. Study teams should download all regulatory documents and maintain copies in the regulatory binder. Follow these instructions if you are UCSF faculty, staff, resident, fellow, or student OR if you have a UCSF ID # and MyAccess account for other reasons. Log in to MyAccess and click on the “IRB-iRIS” link. If prompted, select an account request reason and then click “Create Account.” If you are a resident or fellow, click the new faculty option. Visit the Get MyAccess page and request an account. Contact UCSF Information Technology Services (ITS) for help. Log into MyAccess and click on the “IRB-iRIS” link. If prompted, select an account request reason* and then click “Create Account.” If you are a resident or fellow, click the new faculty option. See the iRIS FAQs for information on getting access to individual research studies after your account is active. 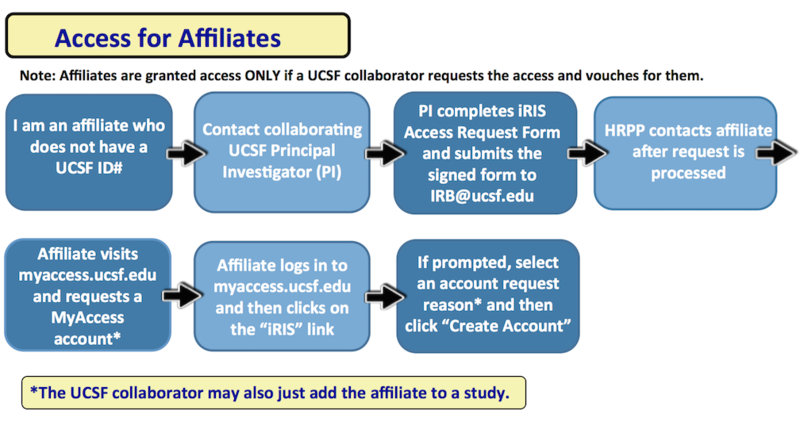 A UCSF PI must complete an iRIS Access Request Form for affiliates, as described below. Access is valid for up to one year. Read below if you are unsure whether an outside collaborator needs an iRIS account. If you have a UCSF ID # and MyAccess account, do NOT submit the iRIS Access Request Form. Follow the instructions above. Complete the iRIS Access Request Form. Scan and email the form to IRB@ucsf.edu. After the UCSF ID for the affiliate is created, you will be able to search for and add the affiliate to your studies in iRIS. You need special iRIS affiliate status to get this access. Contact the PI you work with at UCSF and request access to iRIS. The PI should follow the directions above. Note: If affiliates do not have a department to vouch for them, contact the HRPP office at 415-476-1814. After access has been granted, go to MyAccess and click the “Get MyAccess” link to set up your account OR ask your UCSF collaborator to add you to a study. Go to the MyAccess site and sign in. Click on the "IRB-iRIS" link. Fill out the account request reason page, if prompted. Affiliate accounts expire annually in February. The affiliate's account will be automatically renewed if the affiliate a) is listed on an active study and b) has logged into iRIS in the last year. If the affiliate does not meet the criteria for automatic renewal, the account will expire and the affiliate will not be able to log into iRIS. However, the affiliate can still be added to studies. If an affiliate with an expired account needs to login to iRIS, the affiliate should contact the UCSF sponsoring PI and ask the sponsor to complete the iRIS Access Request Form to renew the account. Follow the same steps (above) you completed for the initial account creation. iRIS has generated some confusion about how investigators are to handle non-UCSF collaborators who fit the definition of Key Study Personnel (KSP). In particular, there is confusion over which collaborators need to obtain iRIS accounts, and how and when to list collaborators on the application. First, you should distinguish between collaborators who will need access to iRIS and those who do not. These collaborators do not need affiliate access. They also will not be listed as KSP in section 3.0 of the application. Describe their involvement in the study as explained below. These collaborators typically need iRIS access in order to make changes to the study or download study documents. You need to request iRIS affiliate access for these collaborators. After access is granted, list these individuals as KSP in section 3.0 and possible 4.0 of the IRB application. Describe their involvement in the study as explained below. Specify that you are collaborating with one or more of the outside site options. Complete this form for each site with which you are collaborating. If you are asking UCSF to serve as the IRB of record for a non-affiliated site, also attach a letter from the site deferring to the UCSF IRB and the collaborators' human subjects training certificates. Elaborate further on what the outside site(s) is doing and its role in the study in this section or elsewhere in the application. For more information on collaborating with other sites, review the Working With Other Institutions page. The IRB may grant special departmental access to department MSOs, department Research Finance Administrators or other individuals who justify needing this type of access. After this access is granted, you will have read-only access to all studies that are being done in your department(s). Email the completed form to CHR.SystemProject@ucsf.edu.